At Nevada Avenue Elementary we have two regular after-school programs available to our students. Other enrichment activities are also available to our students free of charge. However, these programs are offered only one or two days out of the week at various times throughout the year. For more information about our after school programs, please visit the After School Programs page on our website. 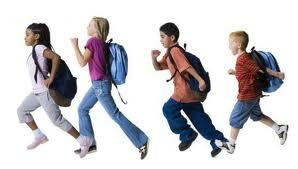 Regular attendance and punctuality are important factors in your child's school achievement and character development. Students that are tardy miss valuable teaching time, disrupt classroom procedures, and distract other students from their learning. Regular and prompt attendance is a mandate of the Los Angeles Unified School District. For more information about absences and student attendance, please visit our Attendance page. District and School Calendar information may be accessed by clicking here. Registration requirements along with necessary documents to enroll your child can be found here. Nevada Avenue Elementary is supporting the District's "Blueprint for Wellness" plan. We are encouraging our students to eat healthy and exercise. We are also focusing on healthy celebrations. For more information, you may visit our Classroom Celebrations page. This year our main sources of communication with our Nevada families will be through the use of the automated telephone system (Blackboard Connect), School Marquee, Flyers & Notices sent home, Notice Board outside the main office, and our school website. For more information about communicating with the school, please click here. At Nevada Avenue Elementary School we follow the LAUSD Policy regarding Students Dress which states all students shall be required to show proper attention to personal cleanliness, health, neatness, safety, and suitability of clothing and appearance for school activities. You will find more details here. The safety of our students is very important to us. Please see review our student drop off and pick up information, as well as our heavy rain dismissal procedures here. The safety and security of our students is our priority. Please follow this link to read about how you can help. All students do better academically, socially and emotionally when the school and family work together. As such we welcome parent involvement at Nevada Avenue Elementary. Please take a moment to look at the many ways you may get involved.